You are here: Home / Blog / Horse Health / Arthroscopy – What do we see? Arthroscopic surgery makes up around 40% of all surgical procedures undertaken at GCEC. Similar to human ‘keyhole’ surgery, this technique allows us to perform a minimally invasive approach to evaluate joint surfaces and treat abnormalities such as osteochondral fragmentation (bone chips). There has been much research into the cause of bone chips within horse’s joints. What we know is that the majority are caused by repetitive injury of the cartilage rather than being due to one acute episode. Cartilage is a shock-absorbing cushion of tissue that overlies bone within a joint and when it becomes damaged over time, it hardens and the bone beneath it becomes brittle leading to an increased chance of it breaking. 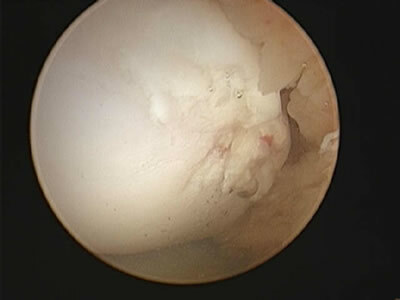 Thus, when a surgeon is able to look at the cartilage during arthroscopic examination, they are able to provide a prognosis for future athletic activity based on the degree of damage to the articular surfaces. What we are also learning is that we can manipulate the health of cartilage through chondroprotective agents given by injection, orally or both. These agents serve to enhance the quality of repair tissue that forms where cartilage defects are debrided and also to reduce inflammation which causes continued cartilage degradation. We often see trends in racing circles between regions of Thoroughbred racing and know that many stables in Flemington and Randwick as well as here on the Gold Coast are administering these products to promote soundness and maximize the number of starts for each horse. We recommend that horses undergo a course of treatment using Zydax and Glyde during their post-operative convalescent period and also during training as well as intra-articular treatments such as IRAP. https://www.goldcoastequineclinic.com.au/wp-content/uploads/2013/12/logo.png 0 0 admin https://www.goldcoastequineclinic.com.au/wp-content/uploads/2013/12/logo.png admin2013-10-01 02:37:362013-10-01 04:45:26Arthroscopy - What do we see?